This specimen of fungiid coral was photographed on a reef in Indonesia. Unlike non-mobile colonial forms that are permanently attached to a substrate, fungiid corals are single individuals and can move -- very slowly -- along the bottom. Reef-building corals commonly have photosynthetic endosymbionts (zooxanthellae) that capture light and also facilitate the deposition of the calcium carbonate skeleton. 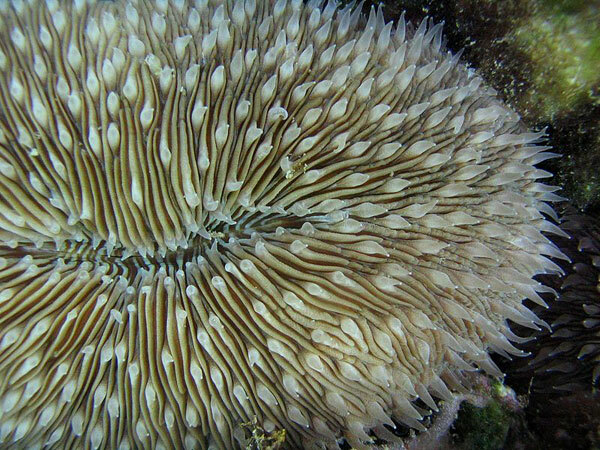 Because fungiids can move, they can find the non-shaded areas on the reef and prevent being overgrown by other coral species, which are constantly in competition for sunlight.